I travelled from Brisbane down to Sydney for a few days again with the intention of doing my 2nd parkrun on foreign soil. I managed to sleep through my alarm and when I did wake I did not really feel like running to be honest but I thought I've come all this way it would be silly to miss out so off I went via Central train station to St.Peters. I had done homework and knew the start was very close to the train station but I couldn't remember which side. At this point two other parkrunners appeared and I asked them but their home parkrun was York and then we were joined by two more who were from a parkrun in Poland. So the Europe division of parkrun quickly made our way into the park. I had a good chat with the couple from York and after a warm up and long brief we were on our way. The course at the moment is an out and back with a steep climb to the top of the park as the turning point for home. When I was heading to the climb the front running was already heading back and he was really shifting. I struggled a bit and had little in the legs for some reason so just jogged round in 21 mins unlike the first finisher who crossed the line in 15:29 (course record) which is fantastic. Even thought I'm not a fan of the area or the course again it was good the do my second parkrun abroad. 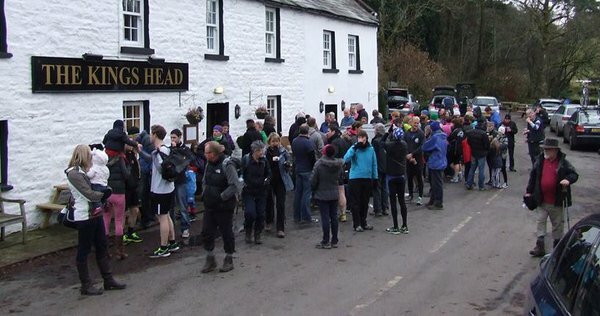 If it were any other 10K I’d not have missed cross country but this is an annual party meet up of old friends many of whom are Howgill Harriers who organise the race. And they do a superb job of it too! Ravenstonedale is tucked away in the hills on the Kendal Road from the A66, a few miles from Sedbergh. Just turn right at the Fat Lamb pub & couple miles or so of narrow undulating country road flanked by high stone walls (which is part of the race route ) you’ll come to another Pub, the Black Bull and the edge of the small village. Registration is in the lovely little school hall which is apt all the proceeds from this race go to the school and the upkeep of the play park across the stream. Tea and an abundance of cakes sales add to the revenue and it seemed everyone was tucking in. Race starts down another lane with the race director standing on one of the stone walls for a quick talk. He tells us there is soup and a roll at the Kings Head after (yes the village has three pubs and all support the race) , free gratis but a small donation to the school is welcome… But, not as small as last year ya tight buggers.. …next he asks if everyone is well because the race has a new medic on hand and he has a new defib he’s not had a chance to use yet, so if you’re feeling peaky…. Go ya buggers is the start cry and we head off past the Kings Head for a little loop of the village before heading on a bigger loop. Narrow country lanes, a couple of short sharp hills, couple of long drags but the rest is just undulating. Jam, Chutney and eggs are for sale at one farmhouse we pass, with a bowl full of coins on a small table outside. Obviously even an honestly box is be deemed unnecessary high security in these parts. Beautiful views are to be had in every direction before we turn onto the ‘main’ road a half mile busy road section. Three cars all waited patiently by farmers marshalling with shotguns in hand and a from there after one short climb it's more or less a downhill finish. My legs were a bit shattered from the previous eve’s football but I had a good run out if not a very fast one. Soup and a roll, spot prizes galore and a nice pint of ale after. Landing in New Zealand on a Monday can only mean one thing, where do we go for Saturday's parkrun? We needed to head south and as we had already done Lower Hutt last year, we had to try a new one. We set off on Saturday morning before 7:30am (parkrun in New Zealand is 8:00am) and got to Porirua with plenty of time to spare. After having a lovely chat to introduce ourselves with George and Astrid one of the volunteers mentioned the incline and was told quickly "shush, don't scare them off". Anyway after the pre run briefing and our welcome, we set off. As usual everyone sped off but soon got into a steady pace. It's always good and bad (you choose) doing a new parkrun route as you don't know what to expect. The incline turned into 2.5k of steady climb, a few levelling out bits, but mainly climb. It is an out and back course and the turn around seemed to take forever. Once turned around I thought that it would be fast all the way back down, but it wasn't that easy. Tired jet lag legs, strange sleeping pattern and not as downhill as I thought. Once at the end it was a 'quick sprint' to the finish line where some welcome cups of water were waiting. We thanked the organisers and headed back. 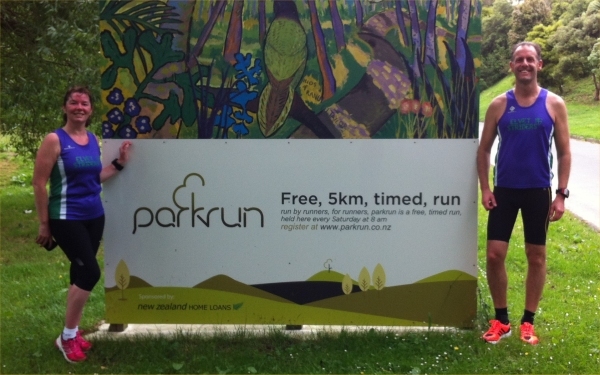 Porirua parkrun is in gorgeous settings (like most parkruns) on good paths, well worth another visit. After a seven year absence Mandy Dawson (known in the Mud household as 'The Warrior') made a triumphant return to the HL today by powering round the tough course to be first Strider home in the Senior Women's race - well done Mandy!! Parking problems meant race starts were slightly delayed but the new challenging course made the wait worthwhile. The Striderettes numbered 18 today and the evergreen Fiona Shenton came in not far behind Mandy to finish second counter with Rachel T clawing her way through from the medium pack to be third home. Joanne Porter also made a welcome return today with a brave performance. Katy W had a fine run on her Medium pack debut and Rachael Bullock, fresh from her cold bath on Weds, had her best run of the season so far. But well done to all the women - that was a challenging course and you all performed brilliantly! We were slightly down on our Jarrow finishing position but still avoided the relegation zone - just! After a chilly wait the men finally got going and Rob Everson was the man to lead the 19 strong team home - for the first time I think - so well done Rob! Will 'done good' today passing a big chunk of the field from the medium pack and finishing second Strider. Youth (Tom S) and experience (James G, Mudman & Gibbo) made up the other counters with the rest of the Striders' team spread liberally throughout the field. As in the women's race there were some brave performances among the Strider ranks - none more so than debutant Alex Cole. Well done Alex! I can't say it ever gets any easier but I can guarantee that, with a bit of hard work, you can expect to finish in a quicker time. A solid team performance but we slipped back to 8th place on the day. The HL takes a bit of a break now with the next fixture at Wrekenton not until 8th Feb. 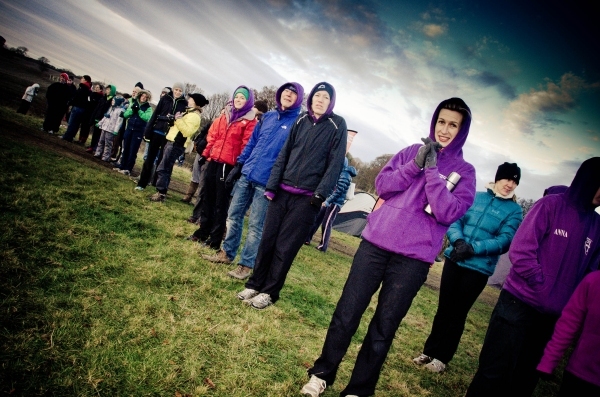 However, in the meantime we've got the NE x/c Champs on 14th Dec & the Northerns on 25th Jan - more on those v.soon! 476 finishers. Men's team finished 7th of 11 in Division 2. 253 finishers. Women's team finished 8th of 10 in Division 1. Not really a race, this was a run that showed the very best of the local running community. Gavin Duffy was a very decent local runner for Billingham Marsh House Harriers who tragically was killed whilst on holiday in Dubai. Unfortunately Gavin didn't have travel insurance and there was quite some doubt as to how he would be able to be returned to the UK. This event came about as a result of this wish to fundraise. On a very chilly Friday evening at the Tees Barrage and using the parkrun course held there approximately 400 runners each turned up, donated a minimum of £5 and ran in memory of Gavin. Marshals and organisers gave up their time freely as did the first aid team. As I said above it wasn't a race and groups of runners shared the narrow course in the best spirit possible. Because it was so chilly I was keen to run hard and hoped it would be a fitting tribute to Gavin, who like many of the runners I didn't know, to push on and finish strongly which I hope I did. There was no timekeeping or results but that didn't matter - the important figure was £3840 - the amount raised on the night. 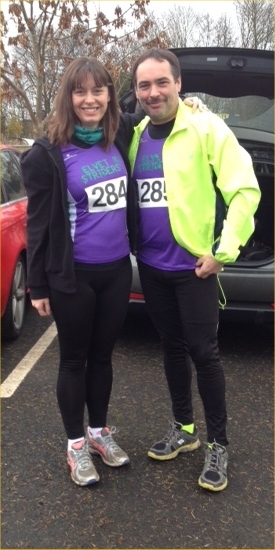 Other fundraising meant that over £17,000 was raised in total, and any funds left over were pledged to be split between Gavin's favourite charities - The Butterwick Hospice, The Jo and Mya Fund, Zoe’s Place baby hospice and Dementia UK. Afterwards many runners including myself and Nicola and Debbie the other two Striders I spotted crammed into The Talpore which was run HQ and provided the car parking. I'm not sure the pub knew what hit them! The bar was jammed to hear a very emotional club mate of Gavin's and organiser of the event, Vicky Fawcett hold it together long enough to compere and announce the fundraising total which was presented to Gavin's parents along with a Billingham Marsh House club vest, personalised with 33.36 which was the time that Gavin ran at the Leeds Abbey Dash 10k only the week before. All in all simultaneously a sad occasion but also a truly uplifting one. 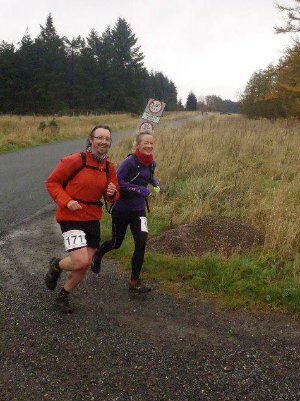 After missing the Brampton to Carlisle last weekend and feeling the urge to do a longer race than 10k I signed myself and hubby, Rob, up for the Northumberland Big 10. Rob had never run that far before and my long run history was the GNR last year and a couple of Broom Park Sunday morning sessions. So it was an adventure to say the least. Packing our bags with the ritualistic before, during and after drinks and some warm clothes in case we got wet we set off for Ponteland. Arriving nice and early at Kirkley Hall organisation seemed reasonable, plenty of signage to the number pick up point and plenty of loos (even for the girls). We picked up our numbers, these were ordered by last name initial, there was no signage to indicate which was where but as there wasn’t a huge amount of runners there was no great problem, got the obligatory pre-race photo taken by a kindly passer-by, met up with Bill Ford, Richard Hall, Rebecca Fisher and Robert Clark and headed to the start line. Promptly at 945am, after a safety chat, set the Garmin and we were off. I quickly lost sight of Rob, Bill and everyone else as they sped off. I stuck to my race plan of staying around the 10 min mile mark, running the sums through my mind of how long it should take me to complete the 10 miles. ‘I’ll be happy with less than 2 hours’, which slowly became ‘hmmm I might manage 1:50’ and as I clocked the miles up thoughts of 1:45 were coming up. The course description was ‘undulating’ and undulating it most certainly was. However what goes up must come down and there were some nice down hills to match the slow inclines (which I am not embarrassed to say I walked most of – also in my race plan). Settling into my stride around mile 4, I plodded on, took a selfie at mile 7, and kept going, managing to keep to my 10 minute mile pace or thereabouts. I soon found myself catching up to a clutch of ladies around the same age as me, which has become a regular feature of my races and then slowly overtook them. There were water stations every 3 miles, semi manned - whatever than means! Marshals were present at most crucial points. Until, as I plodded on all alone, there was a fork in the road, no marshal, no signs and me with a very poor sense of direction. There I was standing at the fork, cursing and thinking ‘which way! which way!’ I asked a passing motorist if she’d seen any runners on the road she’d come down, she answered in the negative so I followed the other option and was quickly reassured by a passing cyclist that there were other number bearing runners in front of me. I reached the 8 mile marker feeling surprisingly positive as it had been a while since I had run that far. Now the 1:45 was firmly in my sight, determined to keep a little bit of leg for that final ‘sprint’ finish I plodded on and on. 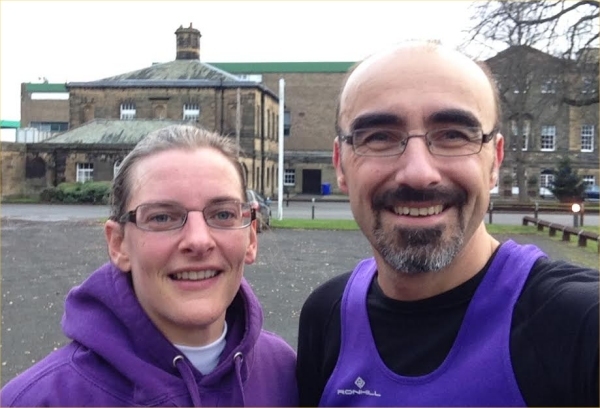 As I round the corner to see the Kirkley Hall main gate, Rob was standing waiting for me, he’d finished at 1: 28: 49, he ran the final 200 metres up to the finish line with me with a freezing cold wind directly in my face as I crossed the line at 1: 45: 22 seconds. We made our way back into the hall to collect our t-shirts, started the Christmas shopping (there were some goodies on sale) and then made our way for a well-deserved tuna and cheese panini and a cup of tea in the Orangery Café before heading off home. Another great day out was had by all at the Bedewell Park Harrier League x/c hosted by Jarrow and Hebburn AC. Striders were there in force with yet another record broken! No less than 26 Strider women turned out for their club (one more than the men's team!) in a field of over 300 women. The day was overcast and chilly with the occasional shower but that didn't deter our women. There were gutsy performances all round with no less than four Striderettes making their x/c debuts (Anita Dunseith, Anja Fechtner, Laura Turnbull & Nichola Whyte). But pride of place goes to our 'Super Secretary' Katy Walton who was not only first Strider home, but qualified for promotion to the Medium Pack in what, I think, is only her second season in x/c. Well done Katy! We're proud of you and each and every Strider lady who battled around the challenging course which was quite muddy in places and this year included a mini hill! The two Fionas (Jones & Shenton) were not far behind Katy making up the three counters and they were supported by a wave of purple vests including Rachel Terry zooming through from the Medium Pack, Camilla & Claire probably having their best ever HL runs and Anna making a welcome return to the mud. This vast ocean of purple, green & white meant that the team had its best result so far finishing in a highly commendable 5th position in the super competitive Senior Women's 1st Division. Well done to you all! The senior men's race once again saw a massive field of 547 runners! It felt like a national championship rather than a local league race as the 25 Strider men endeavoured to find a comfortable starting position among the throng of runners. BANG! We were off and one or two purple vests shot off quickly to try and find clear ground - only to suffer a bit as the race wore on. Club vests of every hue surrounded our guys as they battled through the mud with no quarter asked or given even by our debutant Michael Downes. Paul Evans (The Flying GP) was first Strider home making a well earned return to the Medium Pack - well done Paul! One or two others may be joining him soon with Jerry finishing closely behind & Rob & James not too far back. As ever Will powered through from the Medium Pack to count for the team and even Mudman managed to hold the Chairman at bay to sneak in for that 6th counter spot! 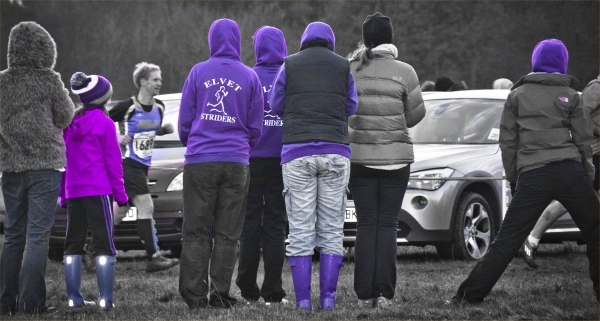 But the purple vests were queuing up behind to push the other clubs even further back in the reckoning. It's was good to see the return of Gibbo, witness Dave Halligan's 'eye-balls out' finish (as we all should do) and to see Striders' own 'Avenger' Jon Steed continue his conversion to mud and make progress up the field. Well done to you all but our 8th position on the day means we can't relax for a second - we need to make further progress and to continue to improve on those individual performances if we're to stay out of the dreaded relegation zone! Striders benefited from the support of numerous Strider children and dogs on Sunday as well as Coach Seheult (The Sage of Shincliffe! ), Bill Ford & Rob's dad - thanks to you all! 547 finishers. Men's team finished 8th of 11 in Division 2. 308 finishers. Women's team finished 5th of 10 in Division 1. There haven’t been many times in the last year that I have regretted signing up for a race but as I stood shivering on the start line at Gosforth Racecourse less than 12 hours after getting home from the Striders Award Dinner and having already done what must be a world-record parkrun tailrun earlier that day (36 mins!) I was feeling the call of my sofa and some hangover food quite strongly. I was also wondering what on earth had possessed Jon and I to sign up for this race when it was already a busy weekend with XC to come on the Sunday and it seems a lot of Striders had sensibly decided to stay in bed as, other than us, the only other die-hard was Alister, so more of a 'Rockpool of Purple' rather than the sea we were used to, but here we were. My only other 5 mile race had been the Bridges of the Tyne where I had gone off too hard in the heat and badly tanked, so I was looking for a bit of an improvement, and this fast, flat course (3 laps of the support road around the racecourse) had sounded tempting and a good opportunity to lay some demons to rest. It was cold, but a good opportunity to give my Christmas Tree hat another airing, and I just had time to confirm the number of laps (glad I did, I thought it was just the one!) before starting off. My pre-race plan was 9 minute miles to get me round in under 45 mins, so I started off at what I thought was a steady pace until a quick glance of my watch a couple of minutes in showed I was running more like 7:50 pace, ooops. Still, despite a mild hangover and tired legs I felt ok, mostly thanks to the fact that the course was indeed pretty flat, and on decent tarmac and there were lots of people to chase. Lots to look at too with the horse race circuit on the outside and a golf course on the inside, so the first lap actually went by quite quickly. I knew from the first lap that the first half was easier than the back half so pushed on and started to overtake people on the second lap. I’d hoped to get round without being lapped but unfortunately that was not to be and the lead guy (who was absolutely flying round) got me with about a quarter of the second lap remaining. This was a bit of a blow but I was still going well and only about 5 or 6 people went past in the end (not Jon, phew!) so not too bad. On to the last lap which was a bit of a battle with some people I’d been chasing all race but I’d timed my push quite well and got past them all, helped by some cheering on the last straight and some very encouraging words from one of the nice ladies I passed on the run-in. So, finished in 41:19 and 100th overall (14th Female) which was not bad at all. Jon had had another excellent race finishing in 33:36 with Alister just behind him (34:50). In the end I was glad we’d come, the organisation was impeccable and it really was as fast and as flat as promised and with ample parking, toilets and tea and coffee afterwards I would definitely recommend it for next year’s calendar, despite the lack of goody bag! A holiday to Australia meant of course my striders vest was packed along with my parkrun barcode. I got there about 30 minutes before the start but just relaxed at the start awaiting my first parkrun on foreign soil. The runners briefing was basically very similar to Alister's which is the beautifully simple thing about parkrun. The formula is very simple but works so it can be transferred easily to any other area / country. I initially thought I would just jog round and make the most of it but I kept getting boxed in and around the mile point decided to up the pace to find some space. The course runs along the river and it's a potential PB course, flat and barring one or two small turns it's also straight. At the turning point I decided to up the pace again to see how many runners I could pick off. It was not long before I crossed the finish line in around 19:26. I had a quick chat with one of the Marshall's about all things parkrun then ran the 2 mile back uphill to shower, change and watch the England fail miserably to play cricket. To run my first parkrun abroad was a great experience and one I throughly enjoyed. After a last minute shift change at work I found myself at a loose end on Sunday so signed up for the Town Moor 10K. By the magic of Facebook I cadged a lift with the infamous George Nicholson and along with Karin Younger we arrived nice and early at the RGS in Newcastle to pick up our numbers and timing chips. The chips were different to any we'd used before and even though 'the oldies' didn't bring their specs to read the instructions we muddled through. It was freezing outside, slippy and frosty underfoot and not much warmer inside the school hall. We all wished there was a cafe for a hot coffee before the start. Moving on the start line Karin, John and I had a little warm up jog, eyeing up the burger van on the way. At 11am we had a 2 minute silence to remember the sacrifice that has been made by so many brave men and women. Then the gun went and we were off! Settling into my usual pace I enjoyed the 2 laps of the flatter than I'm used to course. However, there was a freezing wind blowing right in my face on the inclines which made it a bit more challenging. It wasn't long before Kathleen Bellamy and Gareth Pritchard went past me and Karin Younger was always in my sights with her flowing pre-raphaelite locks like a shining beacon in front of me. I didn't see any other Striders on the course. Aiming for a sub 60 minute finish time I ploughed on enjoying the sunshine and cheering encouragements from the marshalls and other innocent bystanders. George Nick was there cheering me over the finish line to a PB by 5 min 50 seconds - a massive achievement but still 36 seconds over my sub 60 goal. Hugs and congrats were exchanged with the other Striders then it was off to the aforementioned burger van for a well deserved reward. We didn't get any other awards, no medal, no goody bag, no prizes. But still for £7 entry it was a well organised, well supported race and I WILL get my sub 60 10k - next time. I decided to keep running, I was sure I could still manage 3 more miles, but it went again. I stopped stretched it out, warmed my leg a little with harsh rubbing and continued to run. It was no good I couldn't move my leg properly without pain. Female competitors started to over take me. I still needed to get to the end, so I decided after a gut wrenching moment (keeping back the tears) and a small talk with myself 'keep going forget about your time and just get back to the village, stop being a wimp it's only a sore muscle!. I had to just keep going. It was a gorgeous frosty morning in Boltby Forest and I hung my car keys on the dartboard, and filled in the 'Lone Traveller form', which always sounds gloriously ominous. I got onto the starting blocks, was given the nod, and off I sped. And for once, surprisingly, sped is what I did. One by one I ticked off the controls, usually finding they were where I expected them to be. My confidence increased and soon it was time to leave the forest and step out onto the moor. Well what a difference a day makes. As opposed to a night. You can actually see stuff. You can see for ever. The daylight was remarkably forgiving in as much that, when you arrived at the control and found it wasn't there because it was a Gnat's whisker to one side, the daylight smiled on you and pointed you in the right direction rather than letting you plough blindly on into the abyss. A couple of minor errors and a bucketfull of over-cautiosness later and I was finished. Not Bad. It felt like a good run. I checked my printout. Eighteenth our of Eighteen so far (why don't they just put LAST). But by the end of the day I was 32nd out of 36. There's hope for me yet. I don’t think there could be a better start to a Sunday morning than running a fell race on slightly frosty ground in bright November sunshine. I haven’t done more than two or three fell races and this was my first Esk Valley one, but it won’t be my last one. Admittedly most fell races will be longer and more strenuous than this one. Experienced fell runner Jan kindly gave me a lift along with two fell running students, Peter and Lucy. Being a novice I had carefully studied the route map the day before and it seemed quite difficult to get lost as the route was just 4.2 miles long; up a hill, along the forest and back along the Cleveland Way until reaching the same hill where we started. Jan, modest as usual, explained about being near the tail-end of the field, but I knew she would run past me at some point or other. Peter and Lucy would have to wait for me quite a bit as apparently Peter tended to win the races and Lucy was also a very strong fell runner. There wasn’t a great turnout of Striders this time, as apart from Jan and myself there was only Mike Bennett, with Danny being caught up in baby-tending duties. There was just enough time to complete the entry forms and get rid of a few layers of clothing and off we went up the hill. Now, the good thing with fell runs is that you don’t need to feel bad about walking up the steepest bits so after a while most people were having a leisurely walk. Time flew past and soon we were at the end of the forest and turned left and up the moorland. At the top of the first hill I followed the people in front of me, who had obviously done a wrong turn – at this point Jan had caught up with me and explained that the other route was a longer one used in the Viking Chase Fell race. Now it was time to go downhill, which meant I couldn’t keep up with Jan anymore. The rocks on the path felt slippy and I had to keep to the grassy path on the side. Up we went again and then there were two options – along a steeper grassy path (which I followed) and a less steep but stonier and longer route. I was almost a bit disappointed when it was time to descend to the starting/finish point as I felt I still had plenty of energy left in my legs. Jan had arrived just before me, having fallen over and grazed her elbow slightly, and Mike had arrived quite some time ago. Peter (winner of the race), Lucy (amongst the first ladies) and Jan (first lady in her age group I think) were awarded for their effort with well-deserved wine bottles – not a bad award for cash-strapped students. There was also a bit of time to take in the views of Roseberry Topping from the car park. At this point I should really have taken a photo, but I didn’t, so hopefully there are some nice pictures to insert here to inspire more Striders to do the Esk Valley fell races! So there we were, trundling down the A19, me and 3 fellow Northern Navigators towards Thirsk for the North East Night Orienteering Championships. I had weeks of night orienteering practice under my belt from our regular Thursday night training sessions at Low Burnhall and I've orienteered in the dark before, and knew what enormous fun it could be. Oh yes. I asked my fellow faster orienteering travellers what tips they might have for the evening ahead. The answers came quick, fast, and concise. Pacing, Accurate Compass Bearings, and there'd be lots of negative features. Ah yes, negative features. I nodded in what I hoped was an intelligent manner but as it was already dark, my self-conscious nodding was totally wasted on all present. “So, what's a negative feature, then?”. Well, apparently it's a hole in the ground. Or a ditch, or a depression, or a pit. Or, a hole. Soon we were parked, registered, and carrying a large jug of soup and some buns along a track towards the start. 15 minutes later, at the Start, we transferred the soup jug to the Starters and one by one, we made our way into the pitch blackness. I went first, but it wasn't long before I was being passed by later starters. Sometimes I knew who they were, but only because I recognised their Petzls. It was really really hard. I tried to tell myself that I was enjoying myself but there was far too much luck and not enough judgement, skill or confidence in my finding of the controls. Out of the forest and onto the moor. What were the choices here? Solid compass bearings and pacing. And when you got to where the control should be, and it wasn't there, what could you do? Re-locate, identify a new attack point, take a fresh bearing, calculate pacing, and try again. But in the middle of a moor, with the mist down, and no features, where did you relocate to? I checked the map for control 9. It was in oh guess what, a bloody pit. Who knew? I took a bearing, checked, worked out my pacing, and thought, let's go for it. I went for it, but it had gone. I stood where Control 9 should be, but it defied me by being somewhere else. In the right place probably. I looked at my watch and realised that there was no way I was going to get round the remainder of course before it closed in an hour's time. In a sudden flash I realised how I could solve this dilemma. Once the decision was made it was a simple matter to find a path that took me all the way to the finish. I shrugged off the “Well Done's” and admitted that I bailed. They said “Well done anyway!”. They were very kind! In orienteering one missed control is an automatic disqualification, so why miss one when you can miss 8, that's what I say. It was first time I've ever given up in an orienteering competition. Back to the registration area, where hot soup with a swirl of cream was on offer and I was slightly reassured to discover that even the good guys had struggled. Big time. Orienteers far faster and more skilled than me had overshot, relocated and got quite lost. Not as lost as me though. They'd completed the course and finished, including David Aspin who is usually on the other side of a camera taking so many of the great photos that often appear on our website. I heard the organiser ask one competitor whether he'd be back tomorrow to which he replied that he'd be at one of Dave Parry's races. Clay Bank West. I'd fully intended to be back on Sunday for more orienteering but right now a nice uncomplicated fell race sounded quite attractive. Not for the first time this season I was woken abruptly by a shrill alarm at some ungodly hour. I stumbled noisily through the house to locate a coffee pot, where I proceeded to swallow the contents in an effort to remind myself why I was sat in the dark at 5am. Today’s trip would see me heading to the North York Moors National Park, and to the sleepy town of Goathland (pop fact – Goathland features as the village of Aidensfield in the 1960s police series, Heartbeat), to take part in the somewhat low-key, but ever growing Hardmoors. 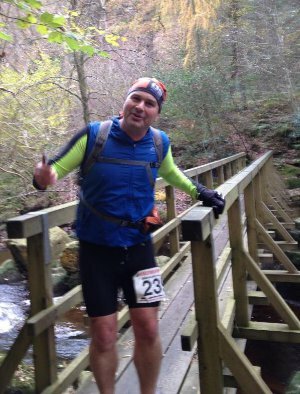 The Hardmoors 26.2 trail marathon series is made up of five challenging, yet beautiful trail marathons, half marathons, and 10k’s based in various locations around the stunningly wild North Yorkshire Moors. Along with several Striders I’d signed up for the half(ish) marathon, with other purple representation in the 10k, and Phil Owen taking on the full distance. We arrived, early, at the village hall in Goathland, greeted by the somewhat intimidating frame of race director John Steele. A few folk were milling around looking busy, making coffee, putting up signs. We took a seat in the hall, compared flapjack, and discussed how many more layers we’d wear on the run (all of them). Fairly soon the hall was bustling, Anna was busying away and Hardmoors veteran Phil was telling stories of past endeavours. Essential kit was checked (waterproof jacket, hat, gloves, whistle, water) and following a race briefing we reluctantly removed our several coats and made our way outside. ..we continued downhill out of Goathland, joined onto a track toward neighbouring Beck Hole, into woodland where we scrambled over rocks and navigated waterfalls. A series of steep steps saw us clamber out of the woodland, as we climbed higher, up onto the moors with spectacular views of Howl Moor and surroundings, which would be our route home. Now though we continued to climb. The field quickly thinned and soon Jules and myself were running alone, with the faint glimpse of fluorescent jackets on the horizon. Due to the steps, rocks and mud in the first few miles it took us some time to find our pace. But find it we did, and the race became increasingly enjoyable with every step. Once into the open moors I was glad to be wearing the layers, and welcomed brief shelter as we passed farm buildings and areas of woodland. Even a brief moment of hilarity ensued as I foolishly stepped waist deep into a stagnant bog, which at least provided a brief warmth to one leg. The greatest part of the race for myself was approaching the cairns on the highest peak, stunning surroundings and biting winds. Heads down we ran together up to the final, brave marshals camping on the moors. We were advised of three miles to go, and all downhill. Suddenly the legs were released, and any energy that may have been sapped on the early climbs returned as we bounded down the non-existent paths, through the heathers and passing bemused walkers. Joining the road and a strong finish back into Goathland and the village hall. A warm welcome, a medal, a selection of cake, tea and coffee. Various tales of injury, ecstasy, and relief all swam around the now muddy hall as runners arrived one by one. Jerry had a great run, finishing 4th in the half(ish), Phil completed (and finely documented) the full, Zoe and Jane arrived safely back with smiles on their faces, and Mark and Anita Dunseith braved the challenging 10k. Once again, fantastic company and a great run from Jules, my newly adopted running buddy. However the main stars of this race were the marshals, standing for hours in the open moors, including fellow Strider Aaron who greeted us with smiles and a camera as we passed. Visually this race was stunning, but it was the friendliness of the runners, marshals and organisers that made it memorable. 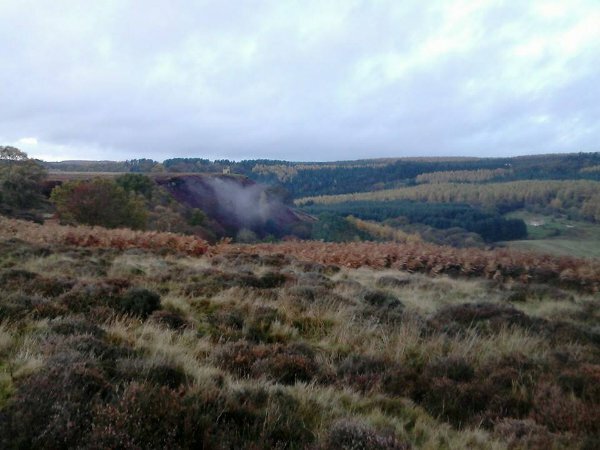 Hardmoors by name, and nature, these are fantastically wild events that celebrate this majestic area of natural beauty. I look forward to the next, and to stepping up to the full distance. I love the Hardmoors events but I’m a bit biased as I’ve been with them almost since the beginning when the only race was the 110 mile event. Dave Robson and I supported a friend doing the inaugural 110 mile race back in 2008 and the following year I ran it with Dave and Anna as my support. Jon has become a good friend & now among other things I run the social media and edit the website for Hardmoors and part of a core team that helps the RD. Since then the series of Hardmoors events & the Hardmoors ‘family’ have grown out of all recognition but still managed to retain its informal friendly atmosphere. In this the marathons, halves and 10K’s inaugural year I’d promised to marshal them all as I’m running the ultras. However while I was ready with my flask of hot chocolate and camping chair Jon the race director decided he’d ‘let’ me run. Git. Anna and I went over early and we were immediately put to work, Anna on the kit check and then results and me sorting out parking. (Note: 2nd place in the Half marathon was DQ’d when it was spotted someone else was carrying her kit!) . At 9am we were off and out onto a path leading to a fast flowing beck and rocky climb. A lovelier start you could not imagine. For the first 10 miles or so I was running ahead of folk and taking pics for the FB, website and to use in promotional stuff. I let folk pass then ran ahead again overtaking and doing the same. I didn’t have a Garmin on but I guess I ran far more than the official 27.5 miles. (Hardmoors events are always over the billed distance). The route was soon on the beautiful moors and although this was billed as one of the flattest of the new marathons I found it quite hilly. At 10 miles I had chaffing due to a hole in my shorts and ended up putting my buff around my leg to stop it & at about 15 miles my knee had stiffened up quite a bit and I was a bit worried about it. I guess my bit of time off recently meant my legs weren’t used to it. Stuff like this often happens though and by 5 miles later it started to ease and was almost gone by the end. Bridleways, fell , single track, county road, mud & bogs all followed and we finally heading towards Flyindales on Snod hill before heading back inland, crossing the moors road and back to Goathland. One of the things I love about these events (and Esk valley fell races) is getting to explore the North York Moors. It’s the biggest expense of continual heathland in England, right on our doorstep & such a wonderful place to run. 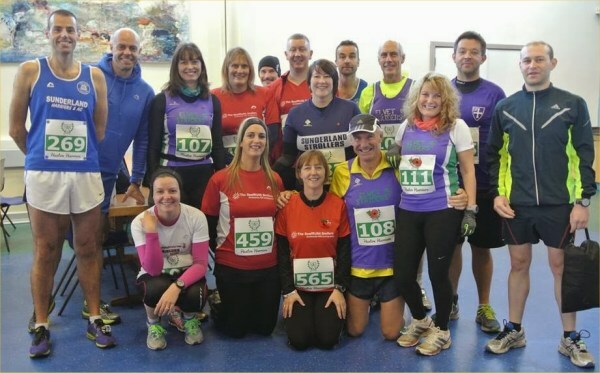 Great to see some many striders represented across all three races, particularly Mark & Anita doing the tough 10K route only a week after Anita's very first 10K! Aaron was a brave & cold marshal on them moors and Anna did the results for all three races. We all celebrated the race success & the Race director Jon’s partner completing her 100th Marathon along with Dave Kamis being the first person to join the 1000 Hardmoors race miles club in the local Hotel bar to round off a wonderful day. I was visiting some friends in the area over the weekend and thought a spot of parkrun tourism would be in order. My friend's husband has recently taken up running so I offered to accompany him to their local event to introduce him to the joys of parkrun and also see if I could get anywhere near a PB on what was alleged to be a pretty flat course. Congleton parkrun is at Astbury Mere, an old flooded quarry which is really very picturesque. Parking was no trouble, they get around 100 people each week so its a nice size and, as is usual, the marshalls were very friendly. After a quick beginners briefing (no need for complications as the route is just 3 laps of the lake!) we lined up on the path and were off. I'd had a quick nosy of the previous week's results and thought that following one of the quick ladies around would be a plan, but it soon became clear this was a bad plan and I gave that idea up after about 500m when they all disappeared into the distance. The course is mainly on gravel paths with a bit of concrete but was indeed pretty flat (10m gradient in total) and really very lovely with the autumn trees in full bloom. Round the first lap and I was puffing quite hard (I blame the cold, and the evil pyramid session at track on Wednesday! ), but pressed on. Rather annoyingly I got lapped right at the end of the second lap by the guy who won, another 5m and I'd have been fine so that made me a bit cross and I picked my pace up a bit for the last lap. It wasn't enough for a PB but ended up being a reasonable time so I was pleased enough, especially when I discovered someone handing out Quality Street at the finish which was great! (something to introduce at Durham Mr Race Director?). I had worn my Striders T-shirt to run in and someone stopped me after the finish to say that their daughter had been at Durham Uni and they had done Durham Parkrun a few times - small world! My friend's husband did really well too finishing about 4 mins quicker than he thought he would and he has promised to return without me and continue running, so I consider that an unqualified success and will certainly return to try the course again next time I'm down that way. I do this weekend of races most years to meet up with some old friends. This year I spent the Friday evening at the Carlisle folk and blues club watching a good mate play while the weather gods started their own music outside. By the time we left and headed to Patterdale youth hostel the forecast high winds had started and the rain was lashing down. Early Saturday morning, as we walked into Glenridding the weather had got decidedly worse with 70mph winds lashing the rain in our faces and the temperature had also dropped considerable. We bumped into another mate Andy who was Marshalling the early 10K race and informed us the race may not be able to take place as mountain rescue were not in favour. These races are often thought of as an introduction to trail racing and they really are but the courses are far from easy. In fact they are far more technical and demanding than many fell races I’ve done. What makes them a great introduction is the Lakeland trail people marshal them every mile and have mountain rescue on hand in every race making them very safe. It’s also fair to say that while at the front end there are some fine athletes, it doesn’t generally attract the top fell racing guys. As the morning wore on the weather if anything closed in more and the hails and sleet stared. We were informed the challenge race and the trail race (the earlier challenge is the same course but for runners who wish to take more time and for Nordic walkers) would go off together at the later start time of 1pm but even this was optimistic and the 14K route was deemed unsuitable in the weather conditions and was abandoned in favour of the 10K route. Normally you’d hear grumbling about a change like this but I think runners were just pleased to get any run in the end. And just a run is all I can say. It was a lovely muddy, rocky route but with far too many people on it. Each gate or turn produced a logjam and any real ideas of racing were pointless. As we descended back into Patterdale the hail and lashing rain hit us with vengeance but still a joyful atmosphere was evident. 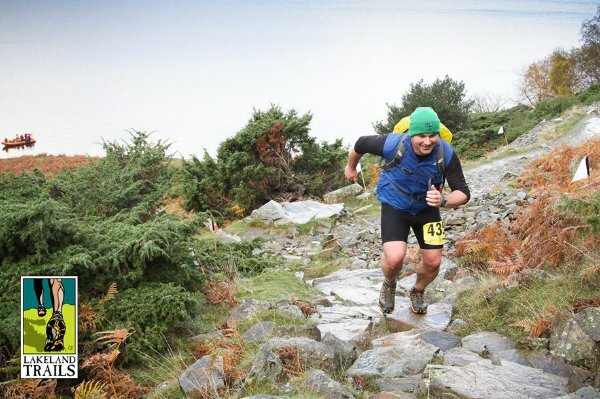 A fine replacement race and all credit to the Lakeland trail people for getting anything at all to go ahead. 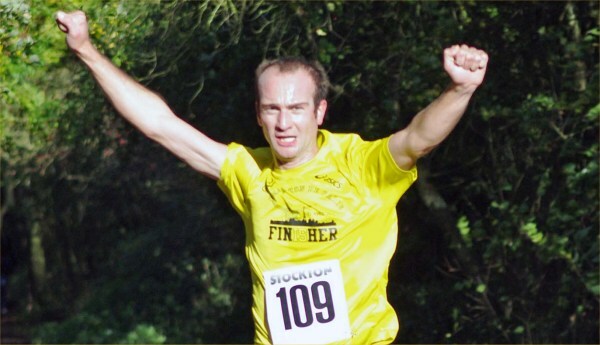 The Sunday 14K race, is one of my favourites. The Ullswater steamer takes you across to Howtown and you simply run back round the lake to Glenridding . The course suits me as its fairly technical and undulating with a couple of good rocky ‘staircases’ thrown in. Fine views of the lake are on offer at various points but you have to be careful when you look as this course is very rocky , tree rooty and muddy. I enjoyed the run, getting into a bit of a race with a tall & beautiful German lass (as you do |). Every climb she would fly up like a mountain goat while I climbed like a rhino but she could never get far enough in front and I would take her on all the down hills. On the last uphill the photographer was coming down the ‘staircase’in the rain , slipped and missed me. He then demanded I stop and he wasn’t missing anyone of the photo’s. Hence one very posed photo! Lucky for me the last downhill is a very slippy grassy winding path followed by another of rocks and scree so I was able to overtake said beauty and get a decent lead. I fully expected her to catch me on the last mile of road and field but I’d just done enough. Though I was still a full 5 minutes over my best time I felt like I’m on the long road back and enjoyed myself immensely. 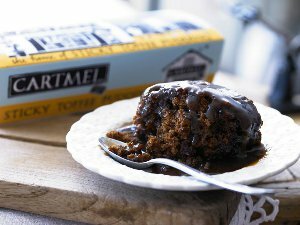 Goody bag of Cartmel chocolate sticky toffee pudding which Anna quickly nabbed when I got back. Great race and I’ll certainly be back. On a nice summer’s morning saw myself and 10 other Striders [ Paul, Angela, Megan, Graeme, Stan, Camilla, Kerry, Rob, Will, Kayden ] and over 200 others turn up for the first Stockton winter 5k trail race series organised by Vicky Fawcett and her crew with the help of Stockton Borough Council, Start Fitness, Sportivate and Activ8. Start at Thorpe Thewles staion in Wynyard Woodland Centre on the tree lined track, the only difference being the leaves were in various shades of red, yellow and brown. Ok so the season was not Summer but Autumn or whatever it is called now. After a mile of level running on the main line - turn right onto undulating farm tracks then along the hedgerow [no wildlife seen] apart from humans. About 2 miles - turn back into the wood, up a steady inclined path to reach the bottom of 50 odd steps. At the top, catch your breath on the decline to pick up the main line back to Thorpe Thewles station pulling in on time at 32.23 mins after pacing Kerry this lovely 5k. I was looking forward to the next at Cowpen Bewley but it clashes with my transport duties to Jarra XC, so it will have to be Preston Park on Dec 8 at 1015. Nearly missed the most important announcement, Will watched his littlun, Kayden in the junior race before tackling the senior event and claiming 3rd prize. Paul kept his spot prize quiet until someone mentioned it on facebook. Overall it was just like a parkrun only on a Sunday. So we decided to look at doing something a week earlier. We toyed with doing Rivington and we had done the previous two races in that series, Girizedale and Howgills, but for some reason that I can't recall, we chose the Steppingley Step, a 26m LDWA event starting from Barton-le-Clay in Bedfordshire. A four hour drive from Durham. We decided to treat ourselves and stay the night before and after. After finding a nice new Premier Inn near Bedford, I managed to book us in a different one, south of Dunstable. What is a few more miles when you have driven that far, I told myself ! I later realised that the Shillington Shuffle, the Sundon Saunter and the Steppingley Step (the LDWA has particular fun with names for its events) take turns to be held and that people who had done all three in a row got a special badge and certificate. This would have been something different, but sadly I didn't grasp this last year. So we turn up at registration at 8.30 prepared to set off at 9.00 as instructed (walkers had left at 8.00). After asking my name, the next question was 'What time would you like to start ?'. I guess this might have happened two years ago, but I had forgotten and I stumbled, unsure of what to say, I wasn't used to having that sort of freedom of choice. Also Melanie was in a different queue as there were different desks depending on surname, so I couldn't have a chat. 'Its okay you can change your mind, just let me know' the registration official said seeing my uncertainty. I went for 8.45 and went and chatted to Melanie who opted for that time as well. The course was initially pretty flat, but in about a mile we encountered the biggest hill of the day at Sharpenhoe. Lots of steps up, it felt like a Hardmoors event. Good views from the top, it was a sunny day though pretty windy. Then downhill towards the first of many lovely villages, Harlington. Many of these villages had attractive churches, some with the bells ringing, and cottages with thatched roofs. Then on to Westoning, which was equally as attractive. The next village, Steppingley, was the second and third checkpoint as the course was basically a figure 8 with Steppingley in the middle. The food here was good - lots of different wraps, jelly, tinned fruit, juice, tea. It was good to know what would be waiting for us in 8 or so miles. Steppingley is on a small hill, so we were running downhill after the checkpoint which felt good although we were aware there would be a climb to get back there. The route was very varied, sometime round the edges of fields, sometimes straight through fields, small sections of tarmac, different types of woodland with the sunlight filtering through. Nothing lasted too long and we changed direction frequently, so there was lots to see and enjoy. It was an excellent route (apparently there have been lots of changes from the route three years ago). We made it back to Steppingley, consumed more wraps and headed off well refreshed for the last ten miles. On to Flitwick and Flitton and on to Pulloxhill with its water tower that can be seen from far away. Here was the last checkpoint. We had thought that we would not get such a spread as we had had at Steppingley, there was only just over 3 miles to go to the finish. We were expecting a few nibbles and drinks. But no, there was a feast laid out before us. Scones covered in lemon curd, jam tarts, crisps, twiglets, pancakes, chocolates .... We probably stayed longer than we should have done. I lost a bit of motivation in the last three miles, I think I hadn't fully recovered from York two weeks ago. Melanie did Jedbugh a week ago so she hadn't found this one the easiest one for her either. 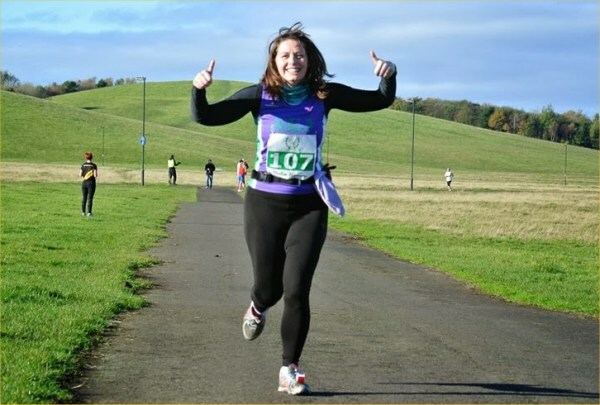 She has now completed twenty marathons in sixteen months, an amazing achievement especially considering what she went through in 2011 and 2012. We made it back in 5hr 22min which we were happy with. The finishing meal was basic, but the event was amazingly cheap to enter and one of the advantages of doing a race in the south was that it was good to meet up with some old friends from the marathon circuit that we hadn't seen for a while. It's a bit early for New Year's resolutions but I have made a decision to stop convincing myself I can't do things and get off my backside and give them a go instead. 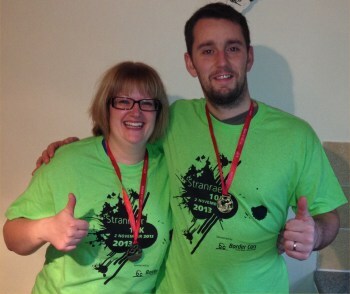 With this new resolve I decided to enter the Stranraer 10k on Saturday that Mark was already signed up for. We were travelling 180 miles to get there so why not? It was a noon start which meant we had a long time to lie in and listen to the howling wind and rain. Nonetheless, given how far we'd travelled we got up and headed to the start. I signed up and got my number and we had a slow jog to the start line. The rain hadn't let up so we were a soggy bunch who set off on through the industrial estate and then onto one of the housing estates. The pack started to spread and Mark left me to my iPod. A steady pace for the first 3km and then a sharp left turn brought me to the Gallowhill. I'd been warned about this and the horror stories were all true! A km long, steep and with a few twists and turns it was a killer. Add to that a shower of rain and hail coming in sideways and I was starting to wonder what on earth I'd let myself in for. My mother in law who lives at the bottom of the hill (and who is lovely by the way) jogged and walked with me on the way up to keep me motivated - I think she felt a bit sorry for me! At the top I picked up the pace and started to look around at the lovely scenery. My friend has a saying when he's running "smell the roses" by which he means taking time to enjoy the world around you while you're running. This came to mind as I ran along the country lane at the top of the town looking at the fields and the loch as I dropped down the next hill back into civilisation. 7km done as I turned back into the industrial estate and headed for the finish. The rain got heavier and there was another hailstorm which stung as it blew in sideways. Like Dory says in Finding Nemo 'just keep swimming, swimming, swimming' so I kept plodding on. In the distance I could see Mark coming back to find me which was a welcome sight. He ran with me as thunder and lightning split the sky. Not far now. Final corner and the school (and finish line) were in sight. I stepped up the pace until I saw the track and used what little reserves I had left for my sprint finish.